ACRO Automation Systems sponsored the Germantown High School FIRST Robotics team #5096, The Teutonic Force. - ACRO Automation Systems Inc.
ACRO Automation Systems sponsored the Germantown High School FIRST Robotics team #5096, The Teutonic Force. ACRO Automation Systems sponsored the Germantown High School FIRST Robotics team #5096, The Teutonic Force. Each high school team is allowed six weeks to design and build a robot, which will be entered into “The FIRST Robotics Competition, a global event encompassing a total of 3,650 teams competing with their genius creations. The Wisconsin Regional competition will be held at the UWM Panther Arena from March 22nd through March 24th. Mike Alburg, an ACRO engineer, served as one of several mentors for the high school team we proudly sponsored. 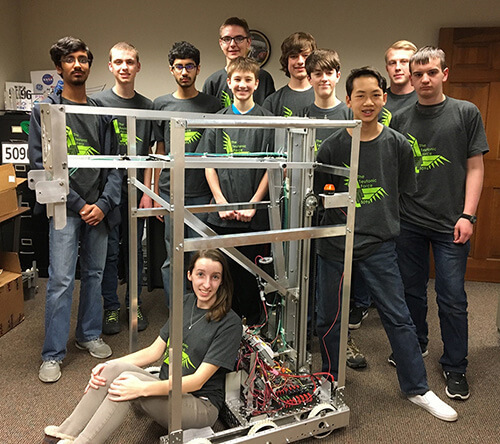 The Germantown group designed a robot to lift and place a square game piece on to a number of platform heights. To score additional points, this robot could also lift itself off the ground at the end of the match. We wish the team continued success and will be rooting for their winnings in the regional, national and international levels of the competition. UPTIME ON TIME, ALL THE TIME! Website by Marketing Metrics Corp.